Just in time for the Christmas holiday season, I offer this personally hand-crafted Christmas Bell Nantucket Basket, perfect for hanging on your holiday Christmas tree! Woven over a wood Nantucket basket mold, with a hardwood (species of wood varies) lathe-turned knob, hand-tapered and beveled cane staves, scruplulously placed with only a whisper of space between the staves, leaving only enough room for the cane weaver to pass through while weaving this basket. The body of the Nantucket Basket Bell is woven with very fine Nantucket-grade cane weaving, tightly woven and packed down compactly, giving this Nantucket basket the ability to essentially hold water - a hallmark of my basketweaving skills.. 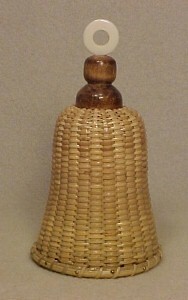 The same craftsmanship is executed in this little Nantucket Basket Bell as in my Nantucket Lightship Baskets - formed rattan reed rims, pre-drilled and nailed with thin brass escutcheon pins, traditional single cane lashing with a piece of formed fine cane to cover the slim gap between the inside and outside rims, plus an additional piece of cane used on the outside to cover the slim gap between the outside rim and the weaving. An elegant carved ivory finial is attached to the top of the bell, and the ivory clapper is attached to the inside of the Nantucket top with a thin gold-colored chain. As are all the Nantucket baskets I hand craft, due to the design, this Nantucket Bell Baskets is signed or dated on the inside of the top of the bell when completed. Multiple coats of varnish are used to strengthen, protect and bring out the beauty of the natural materials. This darling and unique Christmas Bell Nantucket Basket measures 5" high to the top of the finial and is 2-3/4" in diameter. Although I am no longer accepting orders for the Christmas Bell Nantucket Basket, I do craft one or two of these per year. When its ready for sale, you can purchase it directly from my Simply Baskets website.